The Lower Burdekin is the largest floodplain system on the Australian east coast. It has a diverse assemblage of coastal ecosystems, including one the greatest concentrations of wetlands situated in the GBR catchment. Given the magnitude of its physical, biogeochemical and biological process functions, it is an important functional component of the overall catchment of the GBR, and provides a host of ecological functions and processes for the GBRWHA (Great Barrier Reef Marine Park Authority, 2013). However, these high value wetlands within the Lower Burdekin in and adjacent to the Ramsar wetlands of Bowling Green Bay are significantly impacted upon by changes in the landscape, particularly those changes associated with hydrological processes and pollutant inputs (Davis, et al., 2016)(O’Brien, et al., 2016). 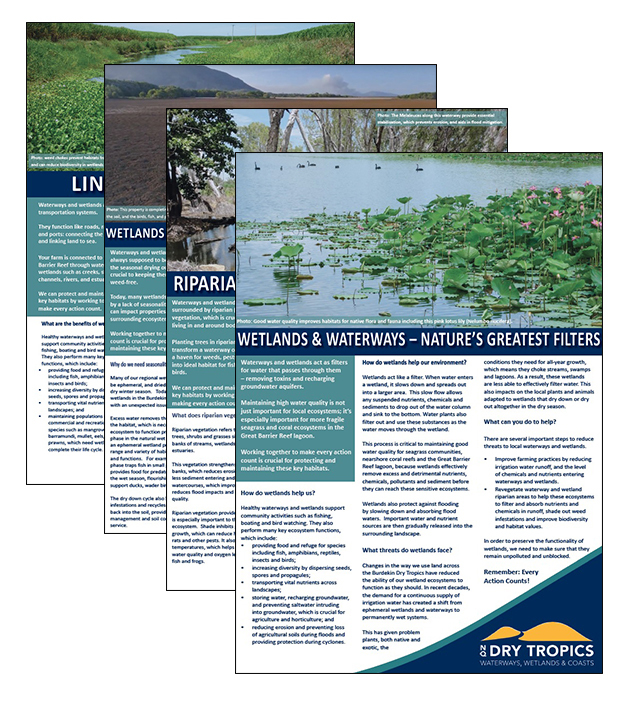 Consequently, the capacity for these wetlands to continue to provide the services so important to the GBR is limited, and now many of these areas act as permanently inundated conduits for bulk water supply and runoff from sugarcane farms. Lower Burdekin Water Southern Divisions (previously South Burdekin Water Board). BHWSS is operated by SunWater and is upstream and on the north-west bank of the Burdekin River. Lower Burdekin Water operates downstream towards the coast in the Burdekin River Delta and supplies and manages the uplift of groundwater. The main matters of concern – including the effects of seawater intrusion, a rising groundwater table, and increasing concentrations of salts – relate to the health of the Burdekin River Delta aquifer and coastal wetland ecosystems. There is increasing urgency to mitigate these issues, because adverse impacts on crop productivity, hydrology, habitat quality, and downstream ecosystem function are becoming more evident. Contributing factors include the amount of water being released through watercourses and channels for irrigation access, deep drainage and channel leakage, and irrigation practices (Milla, 2013). Changes to the landscape and the oversupply of supplemented water through irrigation delivery / channel systems have led to the loss of seasonality in the coastal wetland ecosystems flowing into the GBR. Relatively high ground water levels and perennial surface flows have resulted in a loss of natural water detention, fish passage and nursery habitat, productive native pastures and biogeochemical cycling. One of the major consequences to the wetland ecology is the change and distribution of native plant species and proliferation of invasive exotic weed species. The distribution of weeds also has an economic impact due to a significant loss of productive coastal grazing land as weed chokes spread across the landscape and clog distribution channels, block pump stations and in floods can cause damage to infrastructure (Connolly, 2012). In 2014 the Queensland Government adopted groundwater dewatering provisions in the Burdekin Groundwater Management Area Water Sharing Rules. This allows for the harvesting of groundwater when the table rises to a particular level. While this can assist in removing some of the groundwater during rising events, its long-term effectiveness is yet to be determined. 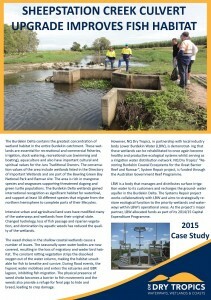 Multiple stakeholders, including researchers, government, and industry groups, have identified the above issues and strategies for the Lower Burdekin Suggested methods to mitigate rising groundwater have included dewatering, groundwater harvesting, improving irrigation application practices, and modernising water supply infrastructure. The updated WQIP identifies priority areas for restoring ecosystem function, or ‘system repair’. Given the complex nature of water resources, a coordinated implementation systems repair strategy is needed to identify clear targets and provide leadership, management direction, and mitigation measures for all stakeholders.